A crispy and crunchy granola full of puffed rice, oats, nuts and seeds, all inspired by Gordon Ramsay himself – enjoy this granola by Gordon! As you all know, I love granola. And I love trying new things to make granola. Most of them are pretty standard, like here, here and here. But this one, this granola recipe is different. I recently borrowed a cookbook by Gordon Ramsay from the library (oh, how great it is to be able to borrow books again … in English, but that’s off-topic). The very first recipe in it was granola, with oats, puffed rice and a whole pile of nuts, seeds and dried fruit. Both Grant and I looked at it and thought ‘yep, I’d eat that’. I was interested in trying it as it didn’t have any butter – just honey to bind it all together. So I followed the recipe and made it – and liked the final product so much that I wanted to include it here. So, this isn’t my recipe – all credit goes to the great Gordon Ramsay – but it is extremely yummy! And is now known to our family as ‘granola by Gordon’! If you don’t have puffed rice to make this, just buy some rice cakes and crumble them up – works just as well at probably half the price! 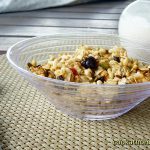 And, as with all granola recipes that I’ve seen and tried, substitutions can be made all over the place – with the nuts, seeds and dried fruit, whatever you have in your cupboard will work well. Melt the honey and vanilla together, either in microwave or on a stove-top. 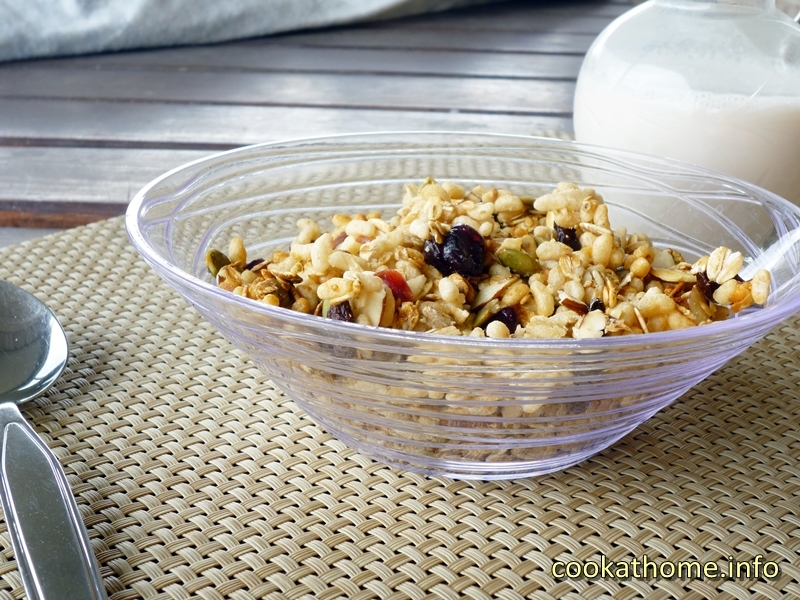 Mix the oats, rice, nuts and seeds together. Pour honey over oats mixture and mix well. Place in a shallow baking tray and smooth out into a thin layer. Bake for 25-30 mins at 180C, stirring occasionally to ensure it doesn't burn. Remove from oven, and stir in dried fruit. For those of us living in the U.S. and not taught the metric/celsius measuring system, I would appreciate seeing the ounce, pound, and farenheit equivalents. Thank you SO much. Thanks for your comment – I do put some US versions on some of my recipes but will keep it in mind for the future.